We, here at Male Pattern Madness, have documented many disadvantages of getting older: declining physical prowess, declining mental acuity, declining sharpness in more or less everything. There are however a few advantages to being middle aged. The biggest is the ability to throw money at any problem. Typically, by middle-age, men have reached a certain level of competence at their jobs and are paid fairly for that competence. Most of the larger purchases, a wedding, a house, a car, have been paid for or at least accounted for. So, not that we’re rolling in dough, but we have a little more cash to throw around if we so chose. There have been times when I and my wife have been stuck at work and we couldn’t find a friend to pick up our kid from school or get him to his appointment, so we threw money at the problem and hired a baby sitter for a few hours to shuttle him around until one of us got home. We recently went on a trip where if my wife crammed one more thing into her carry-on luggage we’d have to check a suitcase, which I hate doing. So, I threw out, “If we’ve forgotten anything, we’ll just buy it when we get there.” This seemed to quell the tide. And we got away without another stop at the circus that is the luggage carousel. The best example of throwing money at a problem was once a family came over for “movie and cookies” night. The other dad had sprawled out on the chaise. (This dad is like Matt W. and once the main titles open, his eyelids shut.) 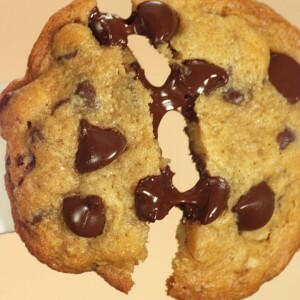 But before the movie started, the fresh-baked, thick, gooey, chocolate chip cookies with melty chips came out of the oven. She gave him that “I don’t want to embarrass you in front of our hosts, so get up” look. But he boldly refused to budge giving her the “this has become a battle of wills” look and just held out his hand for her to relinquish the cookie. She begrudgingly thrust the cookie at him. And so ended the Cookie-Couch Standoff. The best part was, he wasn’t just throwing money at the possibility of spilling on a friend’s couch, (He’s not the type to ever flaunt his money. ); but he threw money at winning a battle of wills with his wife. There are definitely some advantages to having money to throw at problems and that was one of them. What is this money to throw at problems you speak of? I am not familiar with it. My guess is there will be a re-write to this particular blog once children start driving and hit college. This is Ron all over!